Within calendar management you can pick any calendar for editing. You can also use the button beneath the calendar list to add a new calendar. A form will open up where you can specify the calendar values and settings. Enter an adequate name. This is especially important if you share your calendar with other members - the title should be meaningful. Add a short description to the title. It helps other users who might use this calendar to find out which type of events can be found within this calendar. Enter the default colour for the calendar. If you share your calendar with others this colour will be used by default. Every member can later change the colour of the calendar individually. While creating a calendar you can import event data from an external source. The calendar format ics will be used. The single import fills the calendar with event data. You can edit these events or add new events afterwards. If you select the option "Subscription" you need to enter the URL of a web calendar. The data from this source will be automatically synchronised at regular intervals. Therefore it is not possible to edit or add events from subscribed calendars. However, notice that subscriptions of password protected calendars are currently unsupported! You can be notified via email or private message in case of upcoming events from this calendar. You can choose how many days or hours in advance you want to get notified. You can share your calendars with other members. It depends on your user permissions if you can add other members or even user groups to your calendar. You could share your calendar with your friends for example. If you have added the username or a group they can already use your calendar and see the events. 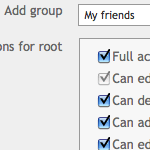 If you click on the name of the user or group you can define the particular permissions of them. If you allow them to edit the calendar they can also change the permission settings of this calendar. So it would be possible that they remove you from the calendar, so you won't be able to use it. Be careful about these settings!